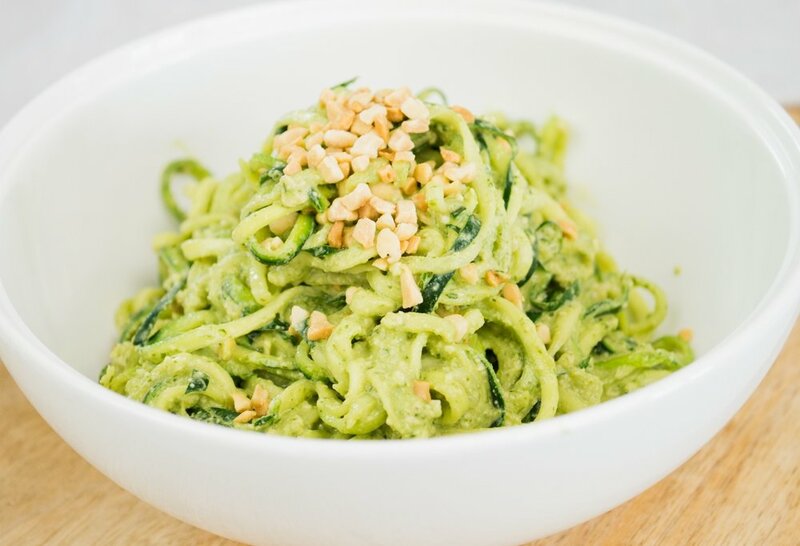 In the video I served the zucchini noodles raw however, I realised after eating them that I much prefer them cooked. So make sure you heat the noodles and sauce up in a pan before serving. If you wnated to serve this cold I recommend that you blanch to zucchini noodles first before mixing the pesto through it. Blend together the basil, coriander, lemon juice, olive oil, apple cider vinegar, water, nutritional yeast, salt and garlic. Add the cashews and blend again. Season to taste. Spiralize the zucchini. If you don't have a spiralizer then use a peeler to create long strips. In a large pan, heat together the zucchini noodles and pesto. This meal is best served hot. How much sauce you add is up to you. Any left over pesto is deliciuous on crackers or with raw carrot. Sprinkle with chopped peanuts as an option.